Kanchanaburi War Cemetery, Plot 1, Row D, Grave 68, Age 36. Mantle was promoted Sgt on ‘Aquitania’ on voyage to Singapore about 17th or 18th January 1942, always wore three stripes and served as a sergeant thereafter. Detached to 2nd Echelon A.I.F. Malaya, for duty on 24.1.1942. 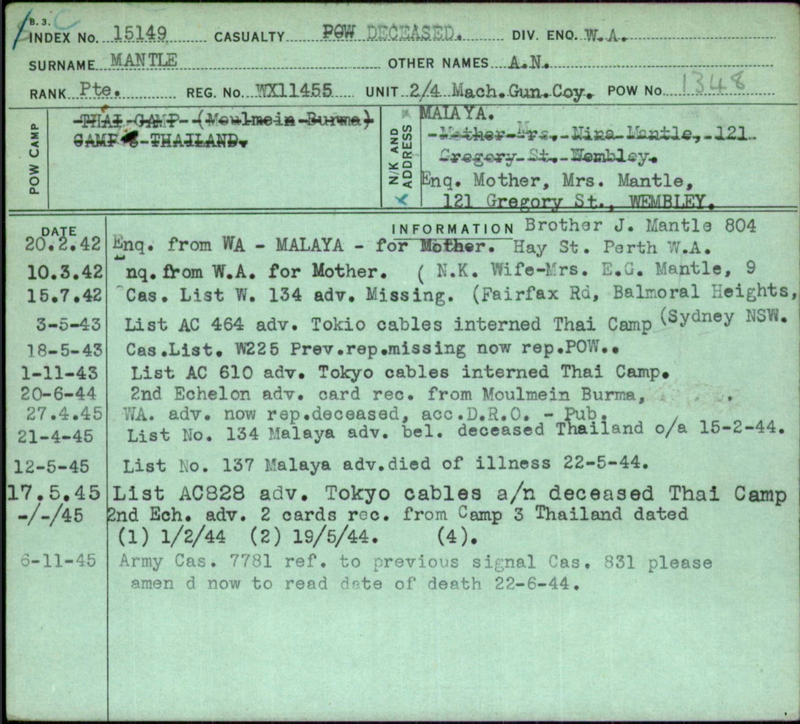 Sgt Mantle joined 2nd Echelon AIF Malaya as a Unit Clerk after the disembarkation of 2/4th at Singapore on 26 January 1942. He ware three stripes and was a member of the Sgts. mess. All Unit clerks at 2nd Echelon representing Battalions or Regiments carried the rank of Sgt or S/Sgt. Mantle was selected in Singapore to work on Burma end of railway and sailed with ‘A’ Force made up of 3,000 men, Green Force disembarking at Victoria Point. He may have also worked at Tavoy before Force moved to the railway and their first work camp Kendau, Thetkaw, Meiloe and finally Aungganaung 105 Km camp before being evacuated to Tamarkan, Thailand. Whether Mantle was ill before he went to Tamarkan we cannot be sure, however it appears likely. Tamarkan was a large hospital camp and he died 22 June 1944 of dysentery and malaria aged 36 years. Harry Pickett reported he was at Tamarkan same as Mantle and had been talking with him about two days before he died. Mantle told Pickett he was feeling ‘bad’ and did not think he would make the grade. Pickett also recorded Mantle was all skin and bone and could not have weighed more than 6 stone. Phil Beilby who was at Tamarkan February 1944 reported several 2/4th members confirmed Mantle had been sick for a considerable time and death was not unexpected. Kearney was also at Tamarkan and had read his name on a Unit list. After the war Mantle’s remains were moved to Kanchanaburi War Cemetery were at least 90 men from 2/4th were laid to rest. Alfred (Norman) Mantle aged 18 years, occupation recorded as builder’s clerk, arrived in Western Australia onboard ‘Otranto’ on 8 February 1927 from London with his family made up of his parents and 3 brothers, Arthur (21) Insurance clerk, Frank 15 years and Peter 10 years both at school. As read in the death notices below, Mantle was active in his community. He was a Scoutmaster at Shenton Park. Father Alfred Mantle died in Perth in 1932 and their mother died in Perth in 1951. WW2 was to bring another tragedy to the Mantle family. Frank lost died in 1942 and was buried in Egypt. Frank had married in Perth in 1941. Youngest brother Peter also enlisted into AIF, fortunately Peter survived. Alfred (Norman) Mantle married in Sydney on 9 January 1942 to Edwina Geraldine Pretty. The above notices were printed in April 1945 West Australian Newpapers.